1870 census for Lime Creek twp., Washington County, Iowa has John Ayers, Farmer b. MD age 80, wife Rachel age 78 b. MD, and Ruth Gordon age 92 b. MD. Rachel and Ruth list parents as foreign born. Parents of seven Children: Elizabeth,// John T.,// James J.b.Feb.8, 1824 // Rachel A, b.1827 // Benjamin, // Ruth, b Mar. 16, 1831 //and Darcus S.
Daughter: Ruth : St. John Protestant Episcopal Parish of Baltimore County MD. lists a Ruth Ellen Ayers as Christened on 5 Nov. 1831, parents John and Rachel Ayers. Of interest is Reuben Rickey was born in 1831 in New Holland, Pickaway Co. OH. This is very near where our Dunnicks were living at the time. John (b. 1816) W.'s wife Henrietta was from New Holland. Reuben wed Ruth E. Ayers. Of interest John (b. 1814) D.. Dunnuck's daughter, Sarah E., born 1843, wed Americus Driskell. Americus' mother was on Emily Ayers. Emily S. Ayers was born in Union County, IN which is south on the OH, IN boarder. d. June 8, 1975, Nappanee, Elkhart Co., IN, Stoney Point Cemetery. d. Apr. 1982 Bur: Stoney Point Cem. Source: Obit for Raymond, see the Nappanee Advance News, publ June 12, 1975, page 8, column 4. I have not sent for this. + June Eileen Dearth, dau of Grover and Florence (Merchant) DEARTH (he was the second of her 3 husbands. Together she had one son. Rebecca (BELL) DUNNUCK (Mrs Samuel) See Samuel - 1st wife - also see index of biographies. m. David GOSHERT (or GUSHARD) 24 Jul 1861, Warsaw, Kosciusko Co. IN They divorced. David was the son of Henry and wife Dekel (KNEPPER) GOSHARD (David b. 8 Jan. 1838 Franklin Co. PA, d 28 Oct. 1927 Warsaw, IN - ). (I have also seen mother's name spelled Deakley Knepper) David was one of 10 children: His siblings were: Jemima (wed to Dimmic LINN in 1850 Kosciusko Co., IN), Elizabeth, George, David, Henry A. ( b. 1847 in PA), Ellen, John, William, Harvey and Jeremiah( b. 1850 Kosciusko Co., IN & wed Martha Huffer in 1879)..
Sarah Jane "Jennie" GOSHERT was born on 8 Oct 1861 in Kosciusko Co., Indiana. She died on 19 Apr 1941 in Warsaw, Kosciusko Co., Indiana. She was buried in Pleasant View Cemetery, Prairie Twp., Kosciusko Co., Indiana. Sarah lived with her grandparents, the Elisha Dunnuck family. Later she lived with her mother and step-father. Sarah fell in love with Chester Phillips but their parents were against a marriage so he married another woman, Lena Cook. When Lena became ill with cancer, Jennie stayed in the Phillips home to nurse her. When she died, Jennie remained as Chester's housekeeper. Source: Kosciusko Co., IN #1 Marriage Index Book B, Page 397 & Book E page 274 /// Will of Elisha Dunnuck /// LDS on line index /// D. Sheldon Copeland of family page. ///1870 census Kosciusko Co., Harrison twp., IN (near Atwood). "Rena" DUNNUCK Same person as Mary Irena "Rena" tombstone has Irena M.
m. Harmon HARTMAN January 4, 1880 (tombstone has J. H. Hartman) Shortly after their marriage Harman and Irena are living in Seward township, Kosciusko Co., IN. b. July 26, 1855. Appears to be the son of Joseph and Catherine Hartman. Joseph is born about 1829 in either OH or PA, and Catherine is born ca. 1832 in OH. Tombstone is listed Father and Mother which would indicate they had children. "Dad's brother Harley A. had only one child, RICHARD NOBLE DUNNUCK". 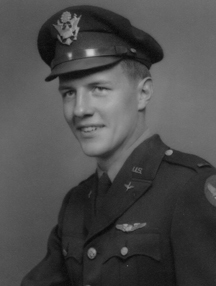 "Richard died in training (1944-WWII) with the Army Air Force, Key Field, Meridian County, Mississippi." (training P-38 Army Air Force). (Quotes from Richard's 1st cousin N.G.Dunnuck). "On this very special day, let us remember, give thanks, for many that have given their all for us, our freedom in America. In memory of Richard Noble Dunnuck, a fine young man and his parents Harley and Mildred, .........I remember well those days of grief for the Chester R. branch of the Dunnuck family" by N.G. Dunnuck, Memorial day, 2003. Richard's cousin N. "Gene" Dunnuck states that Richard was seven years older and after school worked at the Dunnuck grocery store on Miami Street in South Bend with his grandfather Chester DUNNUCK, father and Uncle Noble. Richard also had a sister, P.D. lived 917 Owens Drive, Bloomington, IL. They have 3 sons and 2 daughters. as of 2009 Richard had 13 grandchildren and 11 great-grandchildren. Richard was very active in the Boy Scouts serving as a Scoutmaster for 50 years. He earned the silver eagle. // Retired after 38 yrs from Bendix of South Bend.// Brandywine Citizen of the year. etc. s/o Richard Lawrence DUNNUCK, Sr.
Robert was a bookkeeper at the stockyards. They lived Newtown, Fairfield, Co. CT.
2 daughters J. D. and K.D. Source: obituary in the Patriot-News on Jan 20, 2008, and the York Daily Record (PA) Jan 4, 2008.
get Obit... publ "The Columbus Dispatch," publ June 20, 1965, page 46A. Might this be the same Robert? 1920 Edna not listed with either parent. 1920 census I find a Edna R. DUNNUCK listed as a "boarder" in the home of William M. and Florence B. Becker in Columbus, Ohio. No parents present. Gail age 36 1st wed age 23 PA/PA/PA - many boarders. - no children Columbus, OH. 1939 Robert W.DUNNICK is doing Upholstery work brother Millard C DUNNICK and nephew Paul. b. September 27, 1904 in Jamestown, Kansas. 1930 census Grand Island, Hull Co., NB. and three daughters who are all living in 2004. They were wed when Robert was 19 and Jennie 18. 1939-1940 Norfolk City, Madison Co, NB. Robert A. and Jennie M. Page 83 of the City directory for Norfolk, NB Robert is the Proprietor of Hayes Coffee Shop. They lived at 409 South 9th. d. March 15, 2003, Health Center of Plant City, FL.. Services Heath Funeral Chapel in Lakeland, FL and Graveside services at the Church of the Brethren Cemetery, Libertyville, IA. 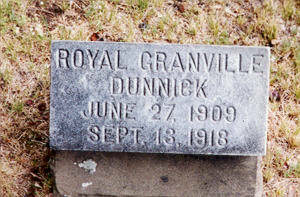 "Mr. Dunnuck moved to Fairfield, Iowa in 1942 where he managed several theaters, was Mayor for several terms, and operated various businesses over the years. He retired to Lakeland in 1981. In a 1957 letter from Bob's half-sister Emma to another of Robert's daughters: "Your daddy name himself Robert -- the folks just named him Adair."..... "Your Daddy was generally a pretty good boy." Surviving are wife, Avis and a son R.D. Barbara (DUNNUCK) SCHORI of Plymouth. Brick Mason, area Farmer, native of Atwood, on member of cemetery assoc ofr Pleasant View Community Church in Warsaw, IN. his obit publ in "Sturgis Daily Journal" d. Howe, IN. He was a salesman for Canada Life Insurance, Toronto Canada, for more than 30 years. He retired in 1972. He owned and operated Sturgis Bottling Works until entering the U.S. Navy during World War II. While in the Navy, he earned the rank of Motor Machinistâ€™s Mate 1st Class. Wed in July 1930 in LaPorte, IN. Mary was the daughter of Harry E. Downend. Henry moved from IN to Sturgi, MI in 1945 and was a carpenter there. Mary & Rollin were living in Burr Oak, in June of 1972 // Source: Sturgis Daily Journal. No children listed in obituary as living or preceding him in death. WWII see "Notes-- in the South Bend Tribune publ 4/19/1942 of 1010 E. Ewing Ave. Source: Parents Golden Anniv, South Bend Tribune, April 17, 1955 -picture // Fathers Obits South Bend Tribune Nov. 12, 1958 and Nov. 13,1858 // S and Minnie DUNNUCK - Middle name & wives // Harry Downend's obit, June, 1972 Sturgis Daily Journal. Photos thanks to Judy Keller. Buried St. Joseph Valley Memorial Park, Granger, IN. 1920 Roscoe E. age 19 an his sister Edna I age 19 were living in Bremen, German Twp., Marshall Co. IN with their mother and step father Joseph F. Frost. Roscoe was a bookeeper at a foundry. Lura (1901- 1994) Buried St. Joseph Valley Memorial Park, Granger, IN. b. October 17, 1901, La Paz, Marshall County, IN, daughter of William H and Elizabeth J. BESSLER. Lists 3 daughters, 11 grandchildren and 21 great grandchildren. 1930 census list Roscoe -30 and Lura 28 with their three daughters. Living on Marine St. in South Bend, IN. (St. Joseph County) Roscoe is working maintenance in an automobile factory. wife of Harvey M. SMETHERS (biography) of Beatrice, NB. Also in Cherokee, KS a Charles B. DUNNIC marries an Alma A. Van Slyke on 6 March 1895. Wonder if they are related...perhaps a brother?? Emma & Elzola had a child, Madelyn born 1926 and d. May 31, 1995 in Ft Worth, TX . Madelyn was married twice. First to Robert Patrick Loftus on January 30, 1949 and they had two children, and second to Frank VanHooser in 1973. "Roy" Arthur DUNNUCK (also see LeRoy*) Wonder who the one following is? d. October 7, 1963 at Contra Costa Co., CA. (another source has San Pablo Calif) Burial Rolling Hills Memorial Park Cemetery. * California Department of Health ...& vital statistics list both a Roy A and LeRoy with the same SS numbers, mother and dates. 1930 census lists them in IL Gertrude age 27, and Roy age 25. The census lists Gertrude as a daughter of Hiram - should be daughter-in-law, and has a "Mother listed - Margaret HOLST, age 71 b. Germany. Gertrude's mother was born in Germany. +. Viola Katheryn PARTRIDGE, January 31, 1934, Beadle Co. , SD. d/o Herbert H. & Nellie (ROWEN) PARTRIDGE.- Nellie was b. 1874 in Rensselear, Jasper Co., IN. also see Edward (b. 1910) and Larry. Sources: 1942 phone directory // farm directory 1854, 1956, 1968 for Beadle Co S.D. // SSDI// FTM & LDS files. d. 1889 d. Mentone, Kosciusko Co., IN. d. 13 Sept 1918 Milton-Freewater Cemetery, Umatilla Co, OR. Betty Hanson. Tombstones from this cemetery were recorded by Garland and Iris E. (SCROGGIN) WILSON in 1984.. The Scroggin name is found in the descendants of Samuel DUNN*CK's daughter Mary "Polly"( DUNNUCK) CURTIS. Two of Polly's sons wed Scroggin girls. See Samuel Descendancy chart. m. #2 Paula May HAASE Jan. 9, 1938 St. Joseph Co., IN (1919-1960) d/o Joseph E. & Emma M.
Blanche is 16 and married to Royce in the 1930 census. She was the daughter of Lee Ora and Florence (CARBIENER) WALTERS. in 1939 she married Floyd E. BASKE who d. in 1983. 1930 census has Royce. and Blanche living in South Bend and have one child, Richard H. age 1 &1/12 or 3/12. Blanche, 16 is probably expecting #2. Royce, age 21, is Driving a truck for the City. Royce & Paula: 4 sons and 3 daus. Source: Marriage records St. Joseph Co. IN Book 107, page 4 // Parents Golden Anniv, South Bend Tribune, April 17, 1955 -picture // Fathers Obits South Bend Tribune Nov. 12, 1958 and Nov. 13,1858 /// SMD - children and grandchildren of Royce - only initials used here as I don't know who is living., also Blanche's obit. publ April 15, 2003 in the South Bend Tribune "Blanche V. BASKE"
WWI draft registration. Right hand missing thumb and all fingers. Left had missing thumb and first two fingers. City Editor of Warsaw Daily News. // 1917-1918 living West Center, Warsaw, Kosciusko Co., IN. Blue eyes, brown hair, medium heights and build. buried together at Oakwood Cemetery are: Ralph, Ruby, their son John, and daughter Mrs. Frances Peacock. 1930 census (can not find them) They were living in Koscisuko County, IN. In the winter above the newspaper office in Warsaw, IN and during the summer month they rented a cottage called the "Minnitonka" on "the island" at Winona Lake (IN). When Ruby was appointed Postmaster at Winona by President Roosevelt, they were required to establish a permanant home in Winona -- on 3rd Street. Not related to the above Ruby Glendola. DUNNUCK whose sister was Pearl. Just a coincidence. RUTH GORDON, 92 living with sister Rachel and Rachel's husband John Ayers. 8 June 1803 [MdHR 11,818, 2-31-14-2]. 08/03/93. Tracking No. : 1692. Circ. No. : 609. Perhaps in Baltimore Co. Md and York Co., PA ....Peachbottom, PA. ???? 1834 - Mother's will written in 1834 - Ruth (and several others) not listed. Ruth Gordon, 71 is living with sister Dorcas and Dorcas' husband William Almony. William ALMONY- 73 farmer,// Dorcas 69,// Abram 20-farmer,// Frances 8,// and Mary 6.// Ruth Gordon 71. 10/12, Margaret A. Simms 17. Ruth Gordon 81, Catherine Cameron 30 seamstress. $2,395 PP, Ann E 60, Ephraim B 27, John W. 20, Frank T. 16, Mary E 26. Henry D.-- as having d. July 11, 1860. - (see Henry's will) Tombstone gives his age as 51 years. Abraham & family then relocated to Ross Co. Ohio. d. 29 Jul 1889, age 82, Sangamon Co. IL. bur Mechanicsburg Cem. 2) (Capt.) Emmanuel CROSS b. Aug. 20, 1837-Fairfield Co., OH d .Nov. 22, 1914, m. Laura I. DAVIDSON, Virden, IL May 31, 1876.// Daughter: Eva (m. Dr. John H .PRINCE of Spfld) // son Abraham CROSS. Ruth (BOWMAN) DUNNICK (Mrs. Thomas J.) See Thomas J.
b. ca 1879, age 1 in the 1880 census for Napoleon, Henry County, Ohio. Not listed in the 1900 census with parents. Ruth's brother, Millard, lists two surviving sisters in his 1950 obituary: Mrs. Diefenbach and Mrs. W. Bennet. b. 15 Sept 1845 Probably born near Chillicothe, Ross county, OH. 1866 when the are listed as members of the Lincoln Circuit of the Methodist Churches in Logan Co. IL - publ by Decatur IL Genealogical Society. Source: 1850 Federal Census for Sangamon County REEL NO: M432-127. Page 270b HH 1993 - August 15, 1850 // The Census has DUNNOCK as does the Probate records.// The United State Biographical Dictionary.... Kansas Volume, pages 422 & 423, published in 1879 by the S. Lewis in Chicago & Kansas City. in the 1880 census, a James Davis, age 21 b. MO listed with the Dunnuck's as a servant farm laborer. Wonder if David Davis is related somehow. 1900 census for Franklin Co. KS, Ohio township. Series T623, film 480, Book 2, page 202 lists: Mary M. born December 1885, E. Clyde born August 1890, Clarence H. b. Nov. 1893, and Florence F. born October 1898. Mother, Ruth had 4 children, all living. Mary DAVIS b. ca Dec. 1885 d. Oct. 6, 1955 in Princeton Co. Idaho. Clyde was sexton at Peone Cemetery for many years. Children: Elizabeth (Mrs. Ernest THOMAS), Carol (Mrs.Warren MAYNARD) Edward b, before 1918 wed Mary BORTHWICK, and Anna Ruth b. 1918 (Mrs. Albert Verl MOORE), and Delores (Jean) married Alfred JOHNSON. + Amy d. Aug 4, 1984 in Spokane Washington and buried in Peone Cemetery in Mead WA. s/o Nathan & Rebecca (Wentzel) CONRAD. They had 6 children. Evelyn Vera (1917- 1962), John Victor "Jack" (1920-1979), plus a daughter and three other sons who were all living in 2000. There is a Clairmont in Alberta, Canada. You might want to check the probate file for David M. Davis probate packet #1010 Franklin Co. KS. I have not checked it. (??) Since David was a Jr. it may well be his father and tell where David was at the time, his siblings and so on. 1930 Census has them both as Music Teachers living in the city of Chicago, Cook Co., IL, census district 1819.
obit publ Aug 15, 1993 in the Indianapolis Star, acticle # 1993227235 - I have not gotten this obit. Lewis M. JUDD's obit was publ Dec. 27, 1996 in the Indianapolis Star, article #1996363114 (b. March 10. 1917, and d. Dec. 26, 1996 at Bagersville, Johnson Co. IL) - I have not gotten this obit. w/o - first wife of Pearl K. DUNNUCK, Stepson of Joshua DUNN*CK (born Pearl KENNARD) Joshua died intestate (without will) so only his biological children could inherit - Pearl was not listed as an heir. + March 27, 1902 Jackson County MO. by a Justice of the Peace. She was from Illinois. In the 1900 census for Jackson Co. MO there is a Ruth Armstong, a widow born Jan 1879 in IL. Her parents were born in IN & KY. Ruth had one child who was deceased. In 1903 Pearl (male) married Mayme so either Ruth died or they were divorced. b. 17 March 1922 (see Albert A.) Might be wife. b. Nov. 3, 1910 in ARK or same records give birth as 04/15/1901 ??? with same death date. Children: Dau: M R D., son M.R.D., son M.A.D.